One of the most influential post-war buildings in New York City, Manhattan House marked the beginning of the age of "white-brick monstrosities" in the eyes of some observers and the first big splash of International Style modernity in the city to others. 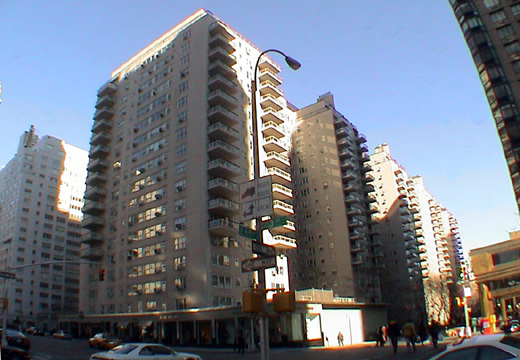 The mammoth development, which occupies the full block between Third and Second Avenues and 65th and 66th Streets, actually is clad in a light gray-brick, but niceties aside it presented a "clean," "neat," almost Spartan appearance in distinct contrast to the historical styles of earlier periods and the Art Deco stylizations of the 1920s and 1930s. Designed by Skidmore, Owings & Merrill and Mayers & Whittlesley, it was built in 1950 and was, according to Robert A. M. Stern, Thomas Mellins and David Fishman in their superb book, "New York 1960 Architecture and Urbanism Between The Second World War And The Bicentennial" (The Monacelli Press, 1995), "the most literal manisfestation in New York of Le Corbusier's postwar conception of vertical living, which the master himself was not to realize until 1952 in his Unité d'Habitation at Marseilles." "Together with elegantly thin window frames of white-painted metal and carefully detailed balconies," the authors continued, "the glazed brick rendered Manhattan House a genteel manifesto for architecture's brave new world, a reassuring statement that Modernist minimalism had more than cost benefits. In addition, the slab offered a distinct contrast with its mundane surroundings - the still-functioning Third Avenue El and its immediate neighbors, mostly old- and new-law tenements. To protect the building's flanks, New York Life [Insurance Company, the developer] acquired the row of tenements on the north side of Sixty-sixth Street, renovated their interiors and painted the facades a tasteful dark gray trimmed in white. The principal innovations of Manhattan House were the bold scale resulting from its single-slab configuration; the departure from traditional urban space making in the refusal to hold the street front except at the base; and the blurring of distinctions between exterior and interior space, as well as front and back yards, by the use of large amounts of glazing at the lobby level. In discussing this last point, the editors of Architectural Record, presumably quoting form a New York Life press release, said that 'the entire development carries out on a large scale, in a big city, an indoor-outdoor synthesis hitherto found mostly in modern country homes.'" The insurance company also protected its investment and views by erecting a low-rise commercial structure that included the Beekman movie theater at 1254 Second Avenue across from Manhattan House that was closed in the early years of this millennium. The insurance company originally had acquired not only the block on which Manhattan House is sited, but also the block just to the south for which it planned a large parking garage topped by a public park. Three hundred of the garage's 1,400 parking spaces were to be reserved for the residents of Manhattan House. The plans for this block, however, would be shelved. Gordon Bunshaft, the principal architect with Skidmore, Owings & Merrill for the project, took an apartment for himself at Manhattan House and at one time Grace Kelly, the actress, also rented an apartment as did Benny Goodman. The building, which has a roof deck, has five projecting bays, each with two balconies and its entrances are along a curved driveway on 66th Street, which was widened on this block because of the project. There are several entrances along the driveway, which is lushly landscaped and the lobbies have floor-to-ceiling windows that permit views from the driveway through to the development's large gardens on the south side, that are walled from 65th Street. A one-story commercial base along Third Avenue originally housed a large Longchamps restaurant that had its own outdoor terrace facing the gardens. Manhattan House is a 19-story building with 581 apartments, many with balconies and some with fireplaces. In 2005, New York Life Insurance Company sold the property to Manchester Real Estate, of which N. Richard Kalikow and Jeremiah W. O'Connor Jr., were principals, for about $625 million. Plans to convert the building to a residential condominium ran into difficulties, however, when the partners got involved in litigation and a tenants' group filed suit to block the conversion. According to the second amendment to the condominium offering plan for Manhattan House, which was dated October 11, 2007, N. Richard Kalikow was longer a principal of the plan's sponsor and Jeremiah W. O'Connor Jr. is the sole principal. The amendment said that the sponsor has entered into mortgage loans with HSH Nordbank AG, New York Branch and that the sponsor must declare the plan effective no later than June 1, 2008. The amendment also said that bona fide tenants in occupancy have the exclusive right for 30 days from the filing of the amendment to purchase their units at a 15 percent discount from non-tenant purchase prices. The amendment indicated that the current total purchase price for tenants for about $958 million. A vacant three-bedroom apartment with three baths and a total of 1,675 square feet on the 20th floor in the E wing has a tenant price of $2,720,000 and a non-tenant price of $3,100,000. A vacant one-bedroom apartment with one bath and 953 square feet on the 15th floor in the same wing has a tenant price of $1,077,987 and a non-tenant price of $1,268,220. A vacant studio apartment with one bath and 586 square feet in the same wing has a tenant price of $604,928 and a non-tenant price of $711,780. Air-conditioning was not included when the building was completed, although the building subsequently allowed protruding air-conditioners and the condo conversion plan included an upgrading of the building that including central air-conditioning. Although scores of apartment houses on the Upper East Side would try to mimic the success of Manhattan House with light-colored brick facades and balconies, there were not too many full-block opportunities. One that is somewhat similar, however, is Imperial House, which was designed by Emery Roth & Sons in 1960 and is nearby at 69th Street and Third Avenue and also features extensive gardens and a very large, windowed lobby but has a center tower. In their excellent book, "The A.I.A. Guide to New York City, Third Edition" (Harcourt Brace Jovanovich, 1988), Norval White and Elliot Willensky remarked that the building's "balconies become the principal ornament, but unfortunately they are small and precarious for those with any trace of vertigo." "(Sometime in the 1980s the original windows were replaced - with regrettable aesthetic results.) The block was occupied from 1896 to 1949 by the Third Avenue Railway System car barns where horsecars and then electric streetcars were housed. It was an elaborate French Second Empire mansarded 'palace.'" This section of Third Avenue has been subsequently developed with many luxury apartment towers and there is convenient local shopping and good public transportation. 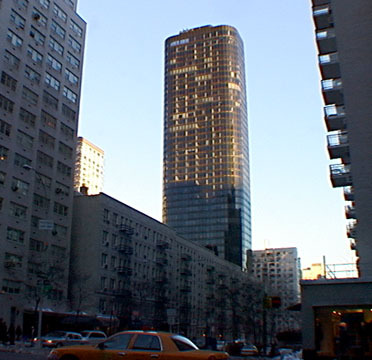 An October 31, 2008 article by David Jones indicated that "the record $1.1 billion Manhattan House conversion on the Upper East Side has run into resistance from several major commercial banks that have either refused to finance condo deals there or demanded exorbitant down payments from contracted buyers." Legal and financial experts said the tight lending environment not only reflects increased concern about financing highly-leveraged projects, but also highlights the inability to securitize super jumbo loans in the multi-million dollar range. Loans of this size are often considered "portfolio loans" that would be carried on the banks' own books and not sold off in the secondary market. "Most lenders have completely changed their loan-to-value guidelines," said Debra Schultz, director and senior mortgage consultant at Manhattan Mortgage Co., the largest residential mortgage broker in New York. 'If you want to borrow 90 percent on a $3 million to $4 million property, they want no part of it.' Schultz said that many of her wealthy clients cannot get financing from commercial banks, forcing her to use private lenders, which include hedge funds and the private banking departments of many investment banks. On March 18, 2011, O'Connor Capital Partners announced that the building had received Fannie Mae approval and that MetLife Bank and Gilbraltar Private Bank and Trust, as preferred lenders, have pre-approved the entire condominium and would henceforth provide conventional and jumbo mortgages to qualified borrowers. The building has an library and lounge, a spa, a yoga studio on the rooftop level and a Roto Studio-designed children's playroom. On October 30, 2007, the Landmarks Preservation Commission declared the building a landmark. Its designation report said that the building "is notable for its impressive size, plan, massing and color" and added that it "was also notable for being oneofthe first multiple dwelling in New York City to attempt 'an indoor-outdoor synthesis' through the integration of large windows and deep projecting balconies, as well as landscaping driveways and a block-long rear garden enclosed by a low granite wall." The report said that the builidng in 1952 received an award from the New York Chapter of the American Institute of Architects, which described it as 'extremely attractive in appearance and beautiful in detailing. '...Few of the white brick buildings it inspired, however, could match the aesthetic standards set by Manhattan House and it remains, to this day, one of the most distinguished examples of housing built in New York City since the Second World War." "New York Life," the report continued, "established a rental housing division in April 1946. Fresh Meadows, in eastern Queens, would be the first development, quickly followed by Stanworth, a smaller 'home center' designed by Holden, McLauglin & Associates in Princeton, New Jersey. With the cessation of hostilities [in World War II], the New York Life, in addition to making mortgage loans on real estate, was prepared to proceed with a long-range program oif investing in housing developments which would be owned and managed directly by the Company. In embarking upon this new field of activity the Company believes that it can not only render a real service to the public but also provide an investment for its funds which should prove both safe and remunerative. Otto L. Nelson Jr. (1902-85), who served as a major general in the U.S. Army during the Second World War, was appointed vice president in charge of housing, with G. Harmon Gurney (1896-1985) as chief architect. Gurney, who began his career in the office of Warren & Wetmore, later worked on such projects as the Williamsburg Houses (a designated New Yorik City landmark) in Brooklyn. He joined New York Life in 1943 and planned Fresh Meadows, Queens, in association with Vorhees,Walker, Foley & Smith. Completed in 1949, this garden-type community provided housing for three thousand middle-income families." "New York Life acquired the land for Manhattan House at public auction in November 1946 about six months after establishing its rental housing division. Few complete blocks in midtown were available for development and the $1.6 million paiid in cash was described as modest. 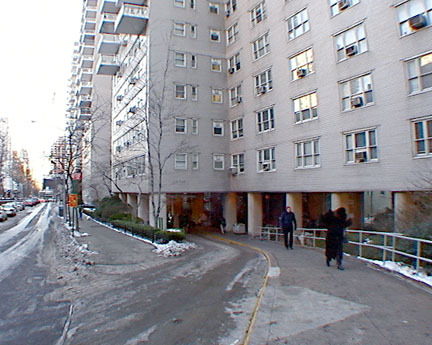 This part of the Upper East Side was a neighborhood in transition; though the Second Avenue elevated railway had been dismantled during the late 1930s, the Third Avenue elevated railway, running from South Ferry to the Bronx, continued to serve the area until 1955, five years after Manhattan House was completed.....The blocks between Second and Third Avenues were particularly undesirable because since 1880 they had been sandwiched between two elevated railway lines. Manhattan House occupies a block where horse cars and trolleys had been stored since the 1860s. Designed in the Italianate style, the car barn was significantly expanded by the architect Henry J. Hardenbergh in the 1890s, adding additional stories, steep masard roofs, and towers." "According to SOM partner, Gordon Bunshaft (1909-1990), it was Mayer & Whittlesey that convinced New York Life to bid on the site....Albert Mayer (1898-1981) founded the firm in 1935, forming a partnership with Julian Hill Whittlesey (1905-1989)....Mayer...was a member of the Regional Planning Association and founded, with architect Henry Wright and critic Lewis Mumford, the Housing Study Guild, which led to the establishing of the United States Housing Authority in 1937....In subsequent years, the firm was known under various names, including; Mayer, Whittlesey & (M. Milton) Glass; Whittlesey & (William J.) Conklin (1961); and after 1965, Whittlesey, Conklin & (James S.) Rossant. Notable residential commissions include Butterfield House (1959-62...), 37 West 12th Street, and the Premier (1960-63), close to Manhattan House, at 333 East 69th Street." "...In later interviews, Bunshaft tried to diminish Mayer & Whittlesey's contribution, asserting they weren't housing experts and that New York Life wasn't 'excited about their kind of architecture.' This hardly seems possbile; not only did they convince the client to acquire the site and play a key role in the project's gestation, but Manhattan House shares many featrues with 40 Central Park South...., a 22-story reinforced concrete apartment building designed by Mayer & Whittlesey in 1940-41. As modern in appearance as any work bullt by SOM up until this time, it has a white (and gray) brick facade, a glass-walled lobby, and similar, though shallow, glazed blaconies." "...Bunshaft joined SOM in 1937, after brief periods working with designer William Teague and architect Edward Durrell Stone....During the Second World War, he served in the Army Signal Corps and the Corps of Enginners. In Paris he socialized withwith the prominent French architects August Perret and Le Corbusier. Bunshaft rejoined the SOM office in 1946 and was promoted to full partner in 1949." "...The complex covers approximately 40 percent of the lot....The footprint takes the form of a crenellated slab or a modified H-plan, with short wings extending from a continuous spine. The five crossings, where the wings intersect with the spine, enclose elvators and stairs....New York Life also negotiated an agreement to widen 66th Street. By conveying a 40-foot-wide strip of land along the north edge of the block to the city, two additional lanes of traffic were created. The land between the lanes was then planted with trees....This gift not only allowed the separation of the local and through traffic but because street width determined the height of buildings that adjoin it, Mayer & Whittlesey and SOM were able to design a taller, more uniform, structure." "...The balconies, located above the sixth floor, are especially prominent. Arranged singly,or in pairs, they were an impressive feat of engineeering and were among the first in New York City to project out without visible means of support. According to Architectural Forum, this amenity added $750 to the cost of constructing each unit." "...Many tenants had servants; there were a total of 60 maid's rooms, including 50 in the apartments, and 10 grouped together in a central suite."